As you may know Piper is getting up there. She is almost all the way blind in her one eye (the other eye was surgically removed a few years ago), she has arthritis in her back end (she has a pin in there from a previous injury. She is also now experiencing muscle atrophy around her head. With all of these these geriatric issues I just knew she could not handle a cross country trip. So I started figuring out what to do with her. As I mentioned in a previous post Otis’ new owners agreed to take her on as their own. Which was a true blessing and such a relief to know she would be going to a good home where she would know one of the dogs. So the Sunday one week before selling the farm (and exactly one month after Otis left) Travis and I did the three hour trip each way to drop her off. For us it was like a pre-road trip to see how we would do. It went fine and Riley came with us for the ride. When we got there we received a big welcome and met Piper’s other furry family members. It was so good to see Otis. It was the first time I every had the opportunity to see any of my foster’s in their new home. He looked so good and happy. We checked out their back yard and I snapped some pictures. Piper is enjoying her retirement. She is getting spoiled with treats and visits to the grooming salon. 10 days ago I heard from her new owner and she had lost of good things to report. JUST WANTED TO LET YOU KNOW PIPER IS DOING GREAT. LOVES HER WALKS. SHE LOVES TO BE PETTED AND GETS ALONG WELL WITH THE OTHER DOGS. OTIS IS KEEPING US ON OUR TOES. WE REALLY HAVE TO KEEP OUR SHOES AND REMOTES OUT OF REACH. WE LEARNED THE HARD WAY. OTIS GOES TO THE BODY SHOP FOR FOUR HOURS A DAY. HE JUST SITS AND STARES AT THE CAT. HE LISTENS SO WELL . FRED TOOK HIM A WALK AROUND THE LAKE LAST NIGHT AND TWO GIRLS STOPPED AND HUGGED HIM AT TWO DIFFERENT TIMES. HE JUST LOVES EVERYONE. OUR VETS KNOW HIM BY NOW JUST CAUSE I WORRY. HE GOT A REMOTE AND FRED COULDN’T FIND THE BATTERY SO WE WENT FOR AN X-RAY. A COUPLE OTHER CHECKS FOR ME. HE JUST GOES IN AND JUMPS UP AND LICKS EVERYONE. THEY ALWAYS BRING HIM BACK LAUGHING AT HIM. HE GOES EVERYWHERE WITH FRED. HE ALWAYS WANTED A DOG TO RIDE IN THE TRUCK WITH HIM. HOPE YOU MOVE WENT WELL.THANK YOU FOR TRUSTING US WITH YOUR FUR BABIES. A couple of weeks ago I picked up Lizabeth as my latest foster dog. She is a beautiful and sweet 4 year old Germans Shepard. After meeting her and seeing her beautiful coat I promptly renamed her Sadie. Unfortunately she also came to me sick, by Sunday she had a high fever and what seemed to be an Urinary tract infection. But she was also a trooper, hanging out with me and trying to keep up. I took her to the vet who could not really figure out what was going on with her. I was sent home with fluids for Subcutaneous Infusion and 3 different kinds of antibiotics. Well something worked because she bounced back really quickly. Well, this and 2 pee spots. But she took 4 of my slipper type of shoes out of my closet and arranged them on the couch and chair. After that she was in the crate when I left. She was so good about the crate that yesterday as I was getting ready to leave she was ready to get in the crate all on her own (with out me asking). She also got along great with Riley. This is them playing in the snow. She is so awesome that she almost because my first foster failure. BUT I couldn’t have 3 dogs and her new family is also awesome. They came and picked her up today. Sadie, who might now be called Lilith, is going to live with 2 other Shepards and their humans at their home in a state park in New York. The picture sequence came out cute because she was in between mid scratch, mid yawn and mid licking her chops post yawn. 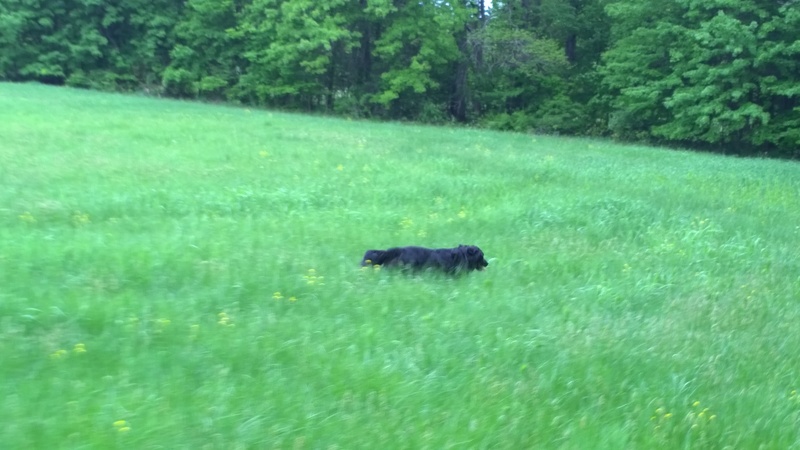 Riley is the official ‘welcome wagging’ of the farm. He greets everyone with the same enthusiasm and love. He runs up to them, starts the happy whining, flops on his back and doesn’t want the attention to stop. The next trial ride he didn’t want to go through the gate right away but I could hear him barking as we were leaving “what about mee?”. So we went on the trial ride. About 3/4 of the way through he come bound up behind us. I guess his nose worked this time. 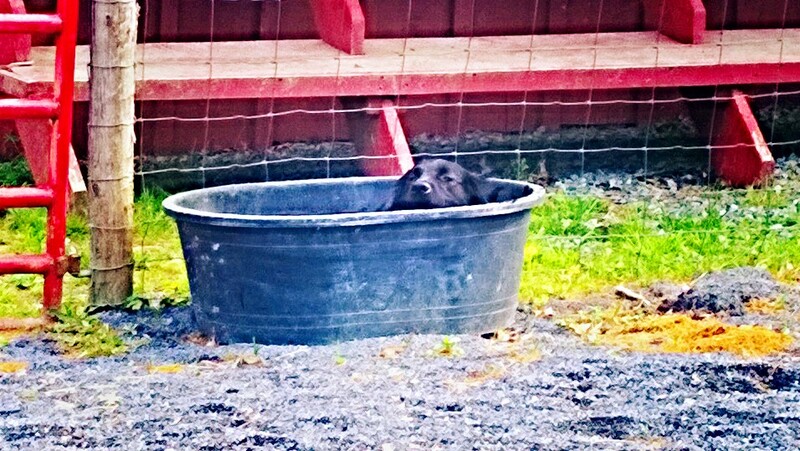 He was so overheated from this run around the field that he jumped into the horses water trough when we got back. I entered one of these photos into the dirty dog contest. If you get a chance click on this link and like his photo so he can win. Click here to like Riley’s photo! It should open with this picture in a pop up window and all you have to do is click like and share if you are so inclined. 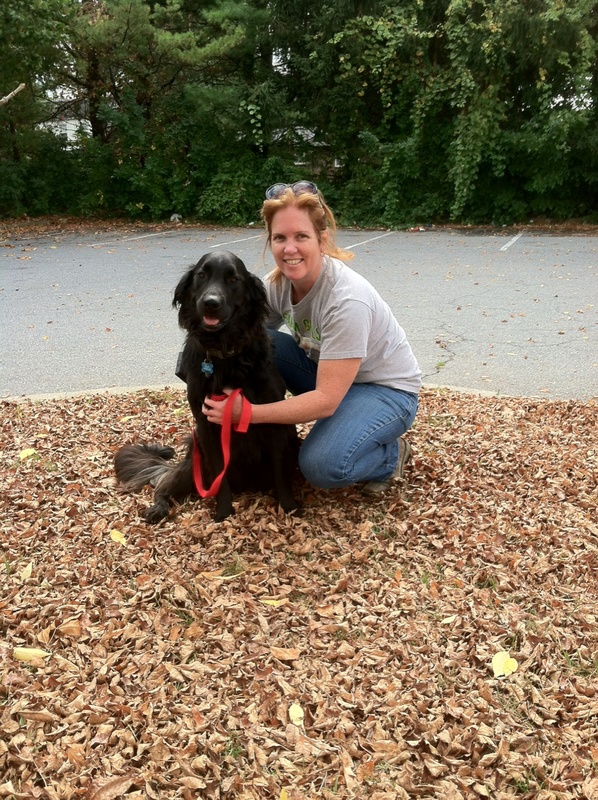 On Saturday we adopted Riley a Flat-coated Retriever from Critter Cavalery Rescue. These are the pictures from when we picked him up. We were with several other adoption families who meet at the drop off point. The dogs were transported from Tennessee to just outside Allentown, PA. He is 3 years old and 70 lbs. Riley has spent the last 2 years of his life in foster care. 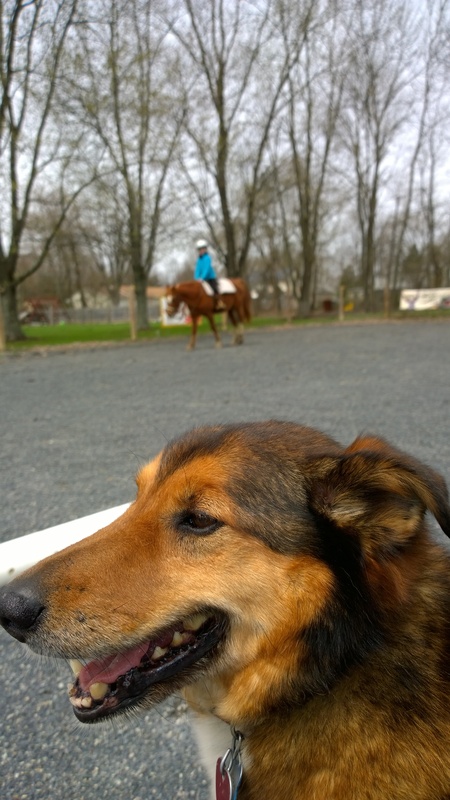 He was living on a horse farm so he was already used to horses, sheep, cats and good with kids. We thought he would be the perfect fit for our farm and are thrilled his foster mom thought the same about us! This was this life before he came to us. He is such a good boy! 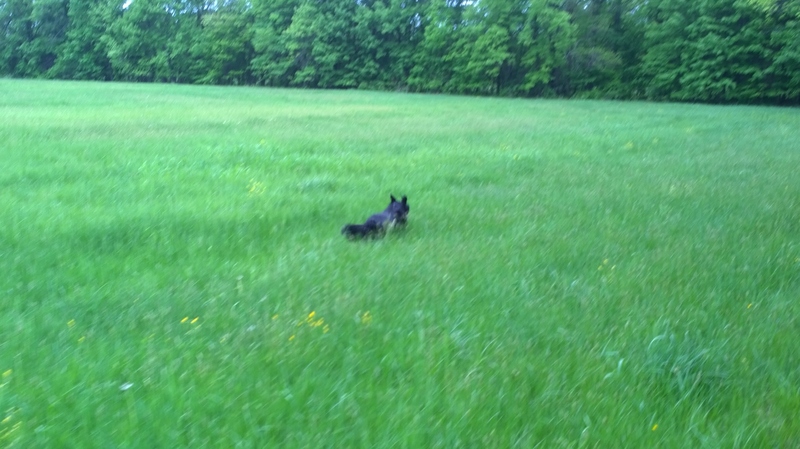 With in a few hours of being on the farm we were able to trust him to stay around and not have to use the leash any more. He comes when he is called. He loves his ears, chest and belly scratched. He is polite and has manners. He does not beg for food while we are eating. He gets along well with Piper. Here are his pics of his first few days with us. 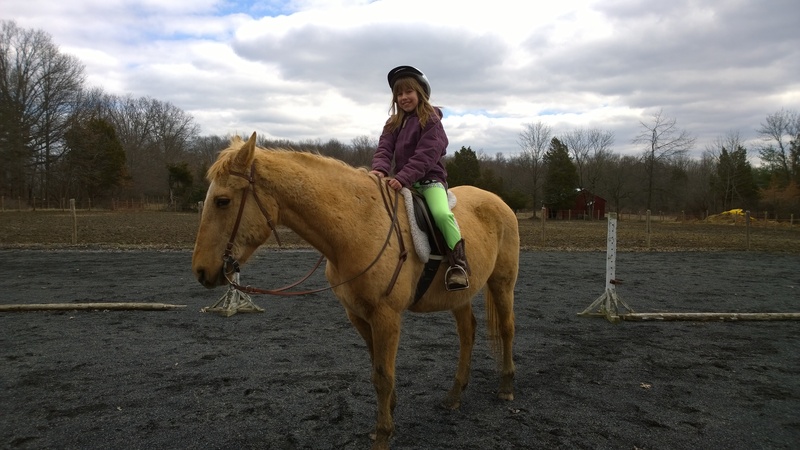 So the object of horse back riding lessons here at GSF is fun. We don’t train you to get ready for horse shows, we don’t look for the most perfect form. We learn the basics and have fun. I love to watch the confidence grow in my students. We learn at their pace. We are safe with helmets and heels down but I try to do fun things as well. 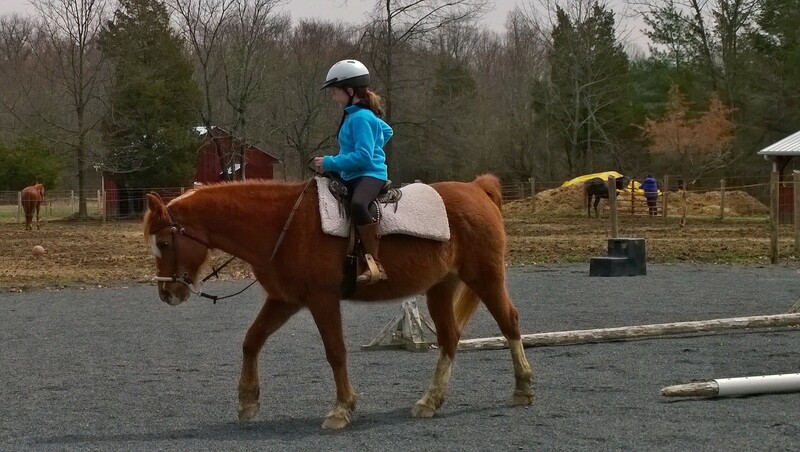 In this video is one of my students cantering for the second time. Casey is such a good boy, he tries to get away with a lot but once he knows he can’t then he will do as you ask. 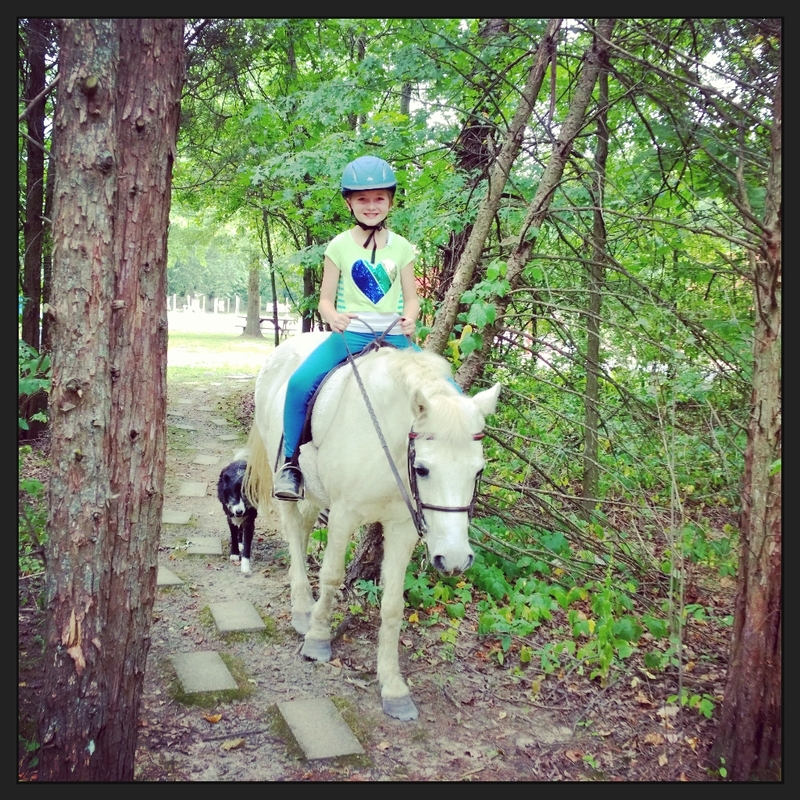 After lessons during the cool down sometimes we go on a a trail ride. It is a great way for the horses and students to unwind. Two years is too short. Less than 2 years ago I rescued Shadow. (Click here to see his welcome home post.) He quickly became one of the best dogs I have ever owned. He truly was my Shadow. He followed me everywhere. He was always keeping an eye on me. 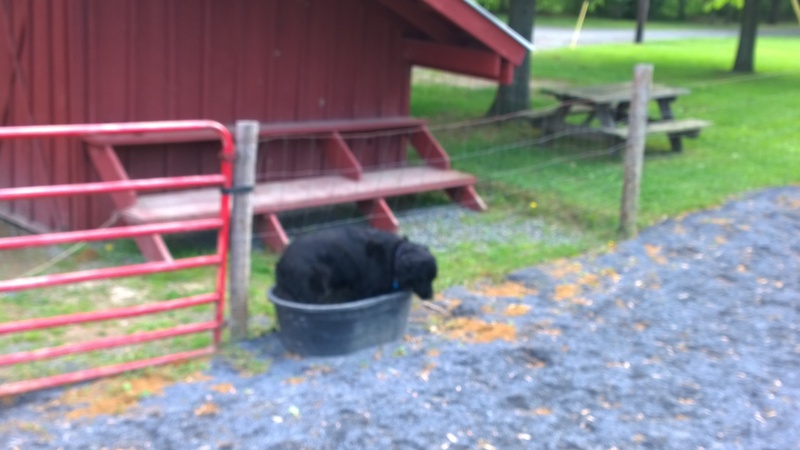 He barked alerting me of visitors to the farm. He went on trail rides with me. He slept by my bed every night. 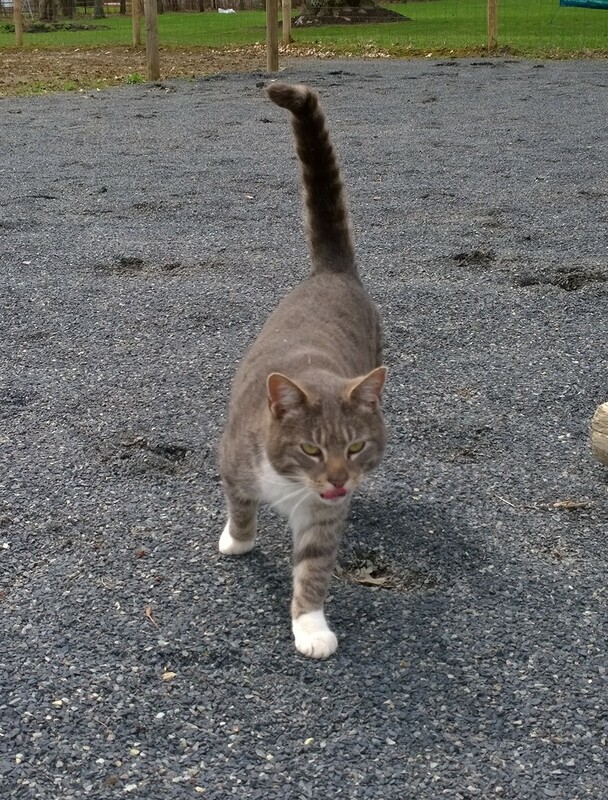 Recently when we would go out to the barn he started checking out the parameter of the property. I called doing surveillance or making his rounds. Well this past Thursday, I guess he went to a neighbors house and somehow ingested ethylene glycol, the ingredient in antifreeze for cars. You can read about it here. Since we had no idea he ingested it we did not catch it in time. His condition worsened all of Friday. By Saturday morning he was having seizures. We took him to the local emergency animal hospital where they admitted him and ran blood test. It was the kidney function tests that enabled the vets to figure out what had happened. My that time he was in complete kidney failure. We gave him 24 hours in the hospital to see if the IV fluids and diuretic medications would help kick start his kidneys. It didn’t. On Sunday morning we made the incredibly sad decision to let him go. We picked up his body later that afternoon and buried him on the property. He will be just off the path between the house and the barn. I miss him so much. I have had animals almost all of my life and have never been this upset by a passing.